One: The sky is the colour of the inside of an oyster shell, much paler than it appears in my photo, for reasons that I don't understand. It isn't fog, or mist, it's dust. Dust which has been present for two days. It couldn't be called a dust storm, more a dust drift. Australia's topsoil is drifting away. Off to new Zealand. Mudgee town and the hills for which it’s renowned are in the background of this photo, but they're covered in a parchment shroud, and the hospital is busy with people experiencing breathing difficulties. Two: How have I not admired this plant, Ballota pseudodictamnus, before? It has been thriving in the garden for at least three years, through heat and drought, and I have callously ignored it. 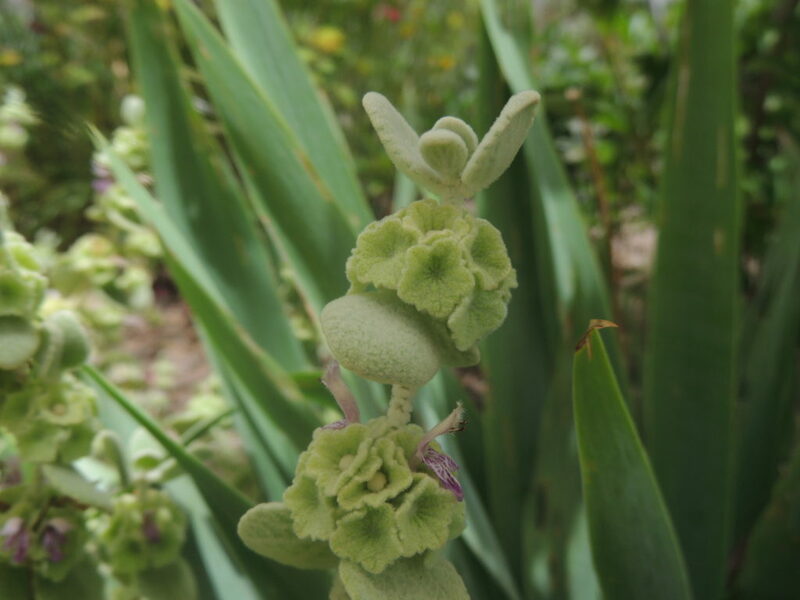 I gathered some for a vase last week and examined it properly, noticing its felty calyxes with their central buttons which look like something an aspiring milliner might attach to a hat, or an upholsterer to a button-back chair. An insouciant topknot completes the picture. 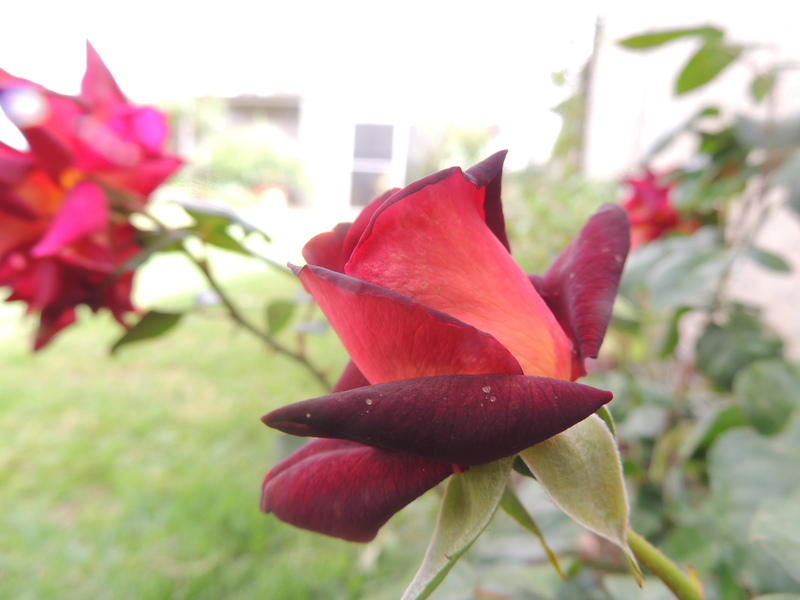 Three: A new rose, the RSL rose, bred by Meilland International, with its deep burgundy and amber petals. 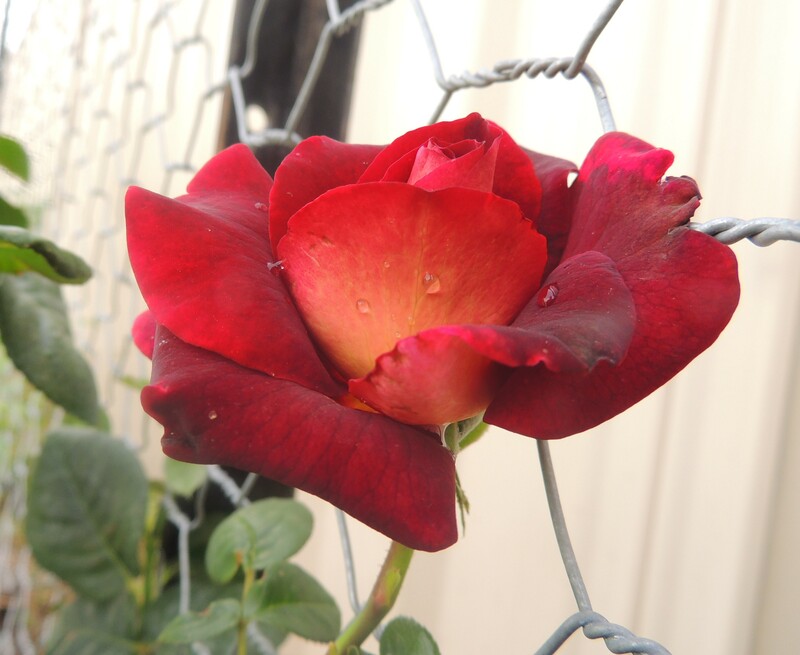 Some of the proceeds from the sale of this rose go towards supporting veterans and their families. 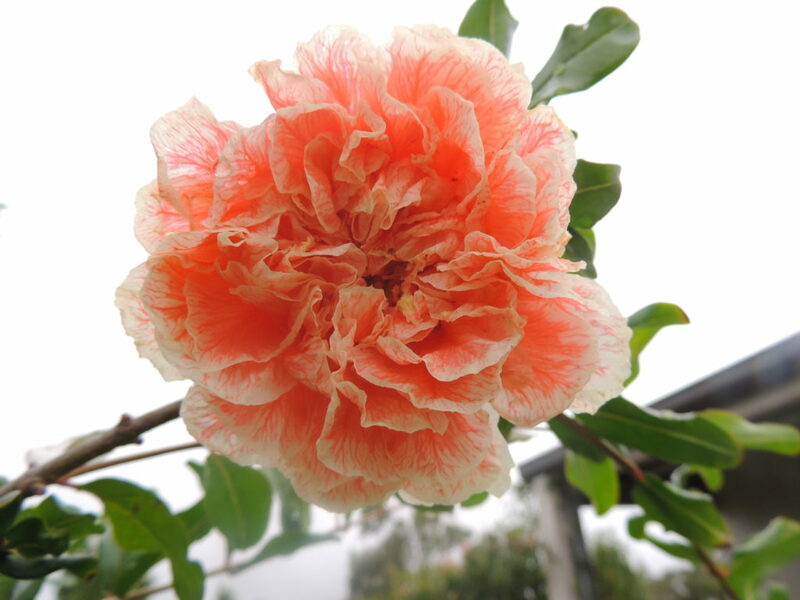 Four: Ornamental pomegranate flower; frou-frou worthy of a prima ballerina’s tutu. I took this as a cutting from our previous garden and was very pleased when it grew. It's another plant that wants to be a shrub, and I want it to be a small tree. I'm not really winning that battle, but I'm quite happy to keep removing the suckers. Five: Figs. Will they be ready by Christmas? I hope some will, at least! It will be a problem keeping parrots and bats away, and although I dislike the look of nets and know they impede the growth of the tree, I’ll have to cover this tree soon, or there’ll be no figs left. Six: Another plant that deserves a closer look: Scabiosa stellata 'Drumsticks'. It's new to the garden this summer and although it has rather insignificant flowers, its papery seed-heads are ping pong ball sized spheres with purple starfish inside patty pan cases. The sunlight is catching the trace of a shower in this photo. That's my six for this week. Gardeners from all over the world are joining in Six on Saturday hosted by The Propagator. Do join in and see what they are doing in their gardens. Weather today: 16 - 30, and it would be sunny if there wasn't so much dust. Great to see your garden again, Jane. It is looking lush with all that rain. The rose is especially enchanting. How very odd it is to have all this dust. You would have thought the rain would have turned it into sludge. Fortunately the dust arrived after the rain, so sludge wasn’t a problem, Tracy. I imagine it could be though, if the two events coincided. That would be unbearable! I hope you had some rain down your way too. We did Jane, as you saw. But the dust is still here! Love that ballota. I don’t suppose it would grow over here…. The dust looks horrible – as an asthma sufferer I really feel for those who are finding it difficult. Hope your figs do their thing in time for Christmas! The Ballota might be happy in your garden if you have a well drained spot to put it. It’s listed on the Beth Chatto website, so it’s available in the UK. It’s quite a scrappy plant in my garden but the flowers are fascinating. I think you might be right about the figs, Fred, though I did hope that a few of the bigger ones might be ready. If I don’t get a net on the tree soon, there won’t be any! Sorry to hear about the dust, Jane. It doesn’t look pleasant at all. (Methinks that was the remains of the dust storm we had about 10 days ago in Melbourne?). That RSL rose is a real beauty. Thanks, Vicki. I’m hoping the Scabiosa won’t be a nuisance in the garden as I have others that are. I planted it purely for the seed heads…thinking arrangements in vases. Today it’s rather windy, the sky is blue and the dust has blown away. Your photos are beautiful and it is so wonderful to see all your greenery. When the leaves are gone, you forget how beautiful and lush the greenery is and vice versa. I love your faux pomegranate, it is exquisite and the figs look inviting. The dust looks ominous and eery. I’ve never seen anything like that. Have a great weekend and a Merry Christmas too! Thank you, Cindy, and Merry Christmas to you across the miles. Today the dust has blown away in the breeze and the sky is blue again. I loved the scabious seeds and I hope the soil stays on the land. Thanks, Cathy. I fear a lot of topsoil has been lost over generations due to excessive land clearing. There doesn’t seem to be a balance between providing food and conservation, although I’m heartened by hearing how some farmers are replanting trees. 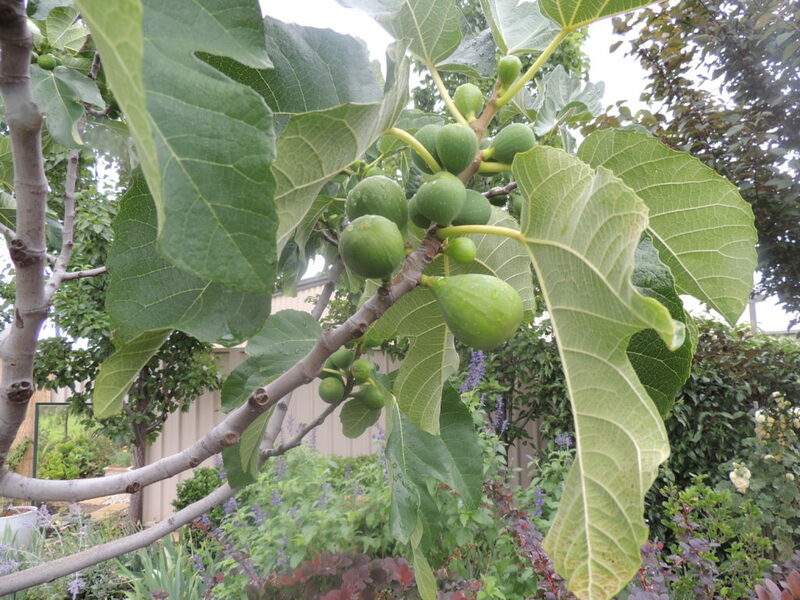 I especially love the photo of your figs – something I enjoy eating but cannot grow here in the Northeast US. My fantasy is to have an attached heated sunroom where I can grow all things tropical! Figs are favourites of mine too, Nancy. I just have to protect them from birds and bats. The scabiousa seed heads are pretty. The ornamental pomegranate flower is a show. Very rose like. Yes, and the good thing about the pomegranate is that it goes on flowering for a long time. That pomegranate flower is lovely! A new one to me. I have fig envy…… it was actually a present for my husband but, since he is not too interested in the garden, I have taken it over. It is perfectly healthy and has plenty of young fruit which either fall off when too small or don’t grow! The positive side is that I don’t really like fresh figs but eat plenty of dried ones!! Hi Granny, if I end up getting enough figs off the tree this year, I intend sun drying some of them! I’m glad you got some good rain but sorry to hear about the dust problem, Jane. I’d hoped the recent rain here would clear the persistent dirty gray blanket hanging over our horizon but the clear view lasted no more than a day. Our poor planet is really struggling. I love the rest of your six, particularly the pomegranate flower. I really need to find a spot for a pomegranate here. A wonderful selection! Do you often get dust pollution? I love the description of the sky. Ornamental pomegranate flower is really pretty. It’s a little difficult to tell from the photo how large are these flowers? Oh dear, that’s bad luck about the figs. I would have thought they’d grow easily in your part of the world as they like a hot dryish climate. The pomegranate flower is a good size, about 5cm across, although the flowers on a fruiting pomegranate are much smaller and less showy. We don’t often get dust, only twice this year, I think. I would never have guessed that was a pomegranite, wonderful! Sorry for your dust, pleased for your rain. Thanks, Gill. I intended to grow a fruiting pomegranate, but the flowers on the ornamental ones are much more interesting. Figs for Christmas, yum. Lovely Scabiosa. I *hope* figs for Christmas! Fred Gardener says perhaps not yet. Beautiful roses! Interesting about the dust….indeed it may well get blown over to us. Love your prose in this post Jane, the oyster coloured sky, the ballerina tutu and the purple starfish in the patty pan cases, delightful descriptions to accompany your beautiful plants. I envy your rain. Owen teased us with promise of rain and while some poor folks got way too much, it came as far as Brisbane then swung out to sea leaving us with 1mm. Oh, I’m sorry to hear about the 1 mm, what rotten luck, Pauline. Fingers crossed for some more before too long. We always seem to be wishing for rain, don’t we. All your photos were lovely as always! My favorites were the fig and the “drumsticks”! Thank you! The ‘Drumsticks’are fun, and will look interesting in a vase, I think. Beautiful pics, Jane and beautiful words as well. I do love the quality and size of your images as I may have said before. The dust looks nasty. How strange that it came after rain and not before. It must be so dry out your way that the water literally sat atop the parched soil and then evaporated. Would that be right? Hi Prue, you’ve made me smile because I’ve lost count now of the things I’ve planted because I’ve seen them on someone else’s blog! Thank you for the photo compliment, but I can’t claim any special expertise as I take all photos with the camera on automatic (far too complicated for me otherwise) and my theme on WordPress attaches them to the blog as they are. Sometimes I do tinkering on the computer for closeups before I add them to the media library in WordPress, but that’s all. It isn’t *so* dry here, we’ve had some good rain ( but not enough to fill farm dams)but it has been hot, so the garden soon dries out. The dust is coming from much further away. 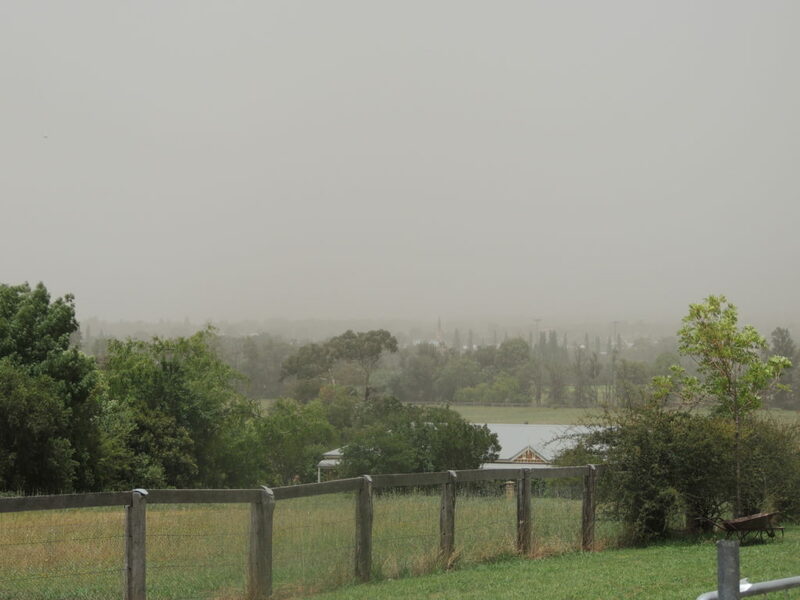 We have had heavy rain and then dust (very weird) in Canberra & the weather app says it is coming from Queensland via NSW..Anyway, the rain is most welcome. I love the flower on your pomegranate tree/bush. I wonder if I can grow it here… we have such severe frosts. I wondered where the dust is coming from, Gerrie. I didn’t think it was from the west because of the colour. I remember well the 2009 dust storm which turned the sky to ochre. We had had frosts of -7.5 last year and the pomegranate sailed through without a scrap of damage, so I think you could try one in Canberra. The fruiting pomegranates are also being grown in this area successfully. I enjoyed your six Jane. The dust is awful. It seems to seep in through cracks barely there. The worst part is the loss of precious topsoil. What a delicate plant the scabiosa is. I’ve always thought the name conjures unworthy images for such a pretty flower. I agree about the scabiosa name, Robyn. I hope this one, which I planted solely for the seed heads ( good in vases, I thought ) won’t be a thug as I have another one that certainly is! Yes the loss of topsoil is certainly an issue- something that has been going on for generations. This is a beautiful six, Jane. That scabiosa has caught my eye in the seed catalogues. The ornamental pomegranate is beautiful too. Sorry to hear about your dust cloud; I remember a red dust cloud from when I was living in Sydney. It felt like the end of the world! It is good to hear that some farmers are planting trees to combat soil erosion. Yes, there was a severe red dust storm in 2009: planes grounded etc.The atmosphere was strange to say the least. 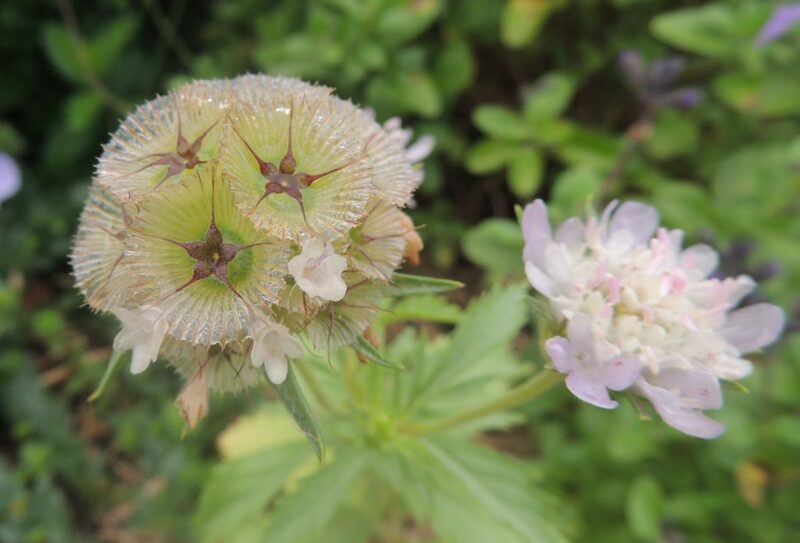 I hope the scabiosa won’t be annoyingly prolific and will supply me with enough seed heads to fill a nice base! That is a beautiful rose. I will keep an eye out for it, because I need to plant a few more in the spaces in my rose garden. Good to hear you’ve had useful rain. We have too and there might be more to come depending on what Owen decides to do next. I hope Owen sent you some rain- but not a deluge! Great photos. How have you overlooked that Ballota pseudodictamnus? It is a wonder. Sort of like a furry Bells of Ireland. Does that ornamental pomegranate not set fruit then? It’s shocking the way I’ve ignored poor old Ballota! The pomegranate doesn’t set fruit, a disappointment I’ve managed to come to terms with, given the beauty of its flowers. I like the scabiosa flower. It’s not a “look at me, look at me!’ sort of flower but rewards a closer look. I have a couple of scabiosa to plant out in the spring, hope theybarent a pest. That’s a nice way to describe it, Mr P.
Yesterday in Sydney we experienced something that is apparently quite rare, especially in summer in the middle of the day: a sea mist that came rolling in up the harbour looking for all the world like a dust storm. We were in the botanic garden and just sat watching it moving toward us. Seems Bondi was shrouded in the mist and when we looked behind us the high rise buildings of the CBD were poking out of the top! It would have been quite something to see that happen. I saw photos of the mist over Bondi…it was very odd with the people sitting on the beach! The Botanical Gardens must have looked lush after all the rain Sydney has had recently. Hey Jane I hope all is well. Love the photo of the Scabiosa. I can’t believe I haven’t been following you. All is well here now that the weather has cooled down a bit! Thanks for the follow.